Trading algorithm is a systematic set of instructions written in a computer language that informs what actions to be taken by a given trading platform. It takes a few seconds for a professional trader to make an expert decision, while for algorithm this time is only 0.0001 seconds. It is not surprising that the majority of financial institutions trust them. Nowadays, 3/4 of the trading decisions are taken by machines, not by people. Their speed of data processing and decision-making gives them precedence over every human mind. 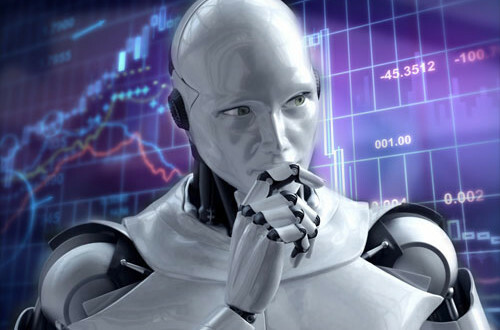 With Forex Robot you can trade without being influenced by greed, fear or even simple mistakes in your orders. Experience and knowledge do not matter to them. The software integrates sophisticated algorithms and management tools. Thanks to them, the robot continuously scans the market and decides when to execute appropriate orders. Trading is one of the most challenging professions in the world. In order to become a professional trader, it takes years infront of the charts, almost always the first ones being losing. Similar is the situation with programming, from here comes the difference between successful automated systems and losing ones. To make a winning system, you have to be a good trader and you need to know the markets. The majority of the creators are programmers but not traders. They are not familiar with the markets and the way they function. This is why they are wandering for years by relying on the principle of random markets – “the price always returns”, trying to eliminate the losses (they do not accept them) and in that they do not manage the risk, they are not familiar with the way Brokerage companies operate and instead of being in tune with their interests are trying to counteract. Martingale is a principle that comes from casinos and aims to beat the roller wheel. Its essence is doubling the stake at a loss. There are thousands of automatic trading systems based on similar principles. They always trade against the movement of the chart and open position after position, usually increasing the volume. The idea here is that when you have trend correction, the "basket" of positions is rapidly gain profit, then the system closes all positions generating a net profit. It sounds great because you always have positions and they are constantly closing, generating small profits, taking advantage of the chaotic market. Sooner or later, these systems have a trend that leads thе account to margin call - once every 100 or 1000 times, the trend does not make correction, and the rising volume leads to quick bankruptcy. This type of system, similar to the Martingale based, relies on random market theory. The robot opens a position in any direction and hopes to make a profit. If the position quickly becomes a loser, the system opens a larger position in the opposite direction, counts that it will win enough to cover the loss of the first one, which also remains open. Again and again, no losses are closed, only a "basket" is closed when it is at net profitable. With a strong trend everything is fine and profits are regular. However, when you take a long period of range movements, your account quickly devours the free margin. The only purpose of this type of system is to take advantage of weak and/or incompetent brokerage firms who have insufficiency in their price quotes compared to the best in the industry. What the system does is track two quote sources making transactions based on information from the one with the fastest quotes. These systems work only with small capital and for a very short period of time. The brokers quickly find similar attempts for "manipulations", then the client is expelled, the profits are held in favor of the broker and in the cases when it is not a regulated broker, the client may forget about the initial deposit. These are systems based on so-called scalping. This is a tactic in which the positions are held from a few seconds to a few minutes. Typical of these systems is that they give great results in backtests with very low and rare losses and colossal return. The problem with these types of systems is that they never work the same way exposed to real trading conditions. The live market conditions do not allow for fast execution, variable spread and adding slippage are also a very important factor due to the large share of the profit. The brokers do not like this type of system as they cause the so-called Toxic flow to the liquidity providers. Some investment firms are directly banning clients that are using such strategies, others simply worsen the trading performance until the client either leave or simply lose all the money. Systems that are pure and simple scam. These may be "holy grail" systems that are programmed to read the tester data for a future period and make profitable trades based on this information. These can also be popular systems offered at a very attractive price. In this case, you get a useless file with no money back option. Any of the above may fall into this category. The website is full with sites promising the next "Holy Grail" with a colossal return for just $ 100. The only thing we would advise you is just to think about it. If you have a winning system you would you sell it for just $ 100? The System is based on pure Price Action – no Indicators, no Martingale, no Grid, no Scalping… Just trend following.